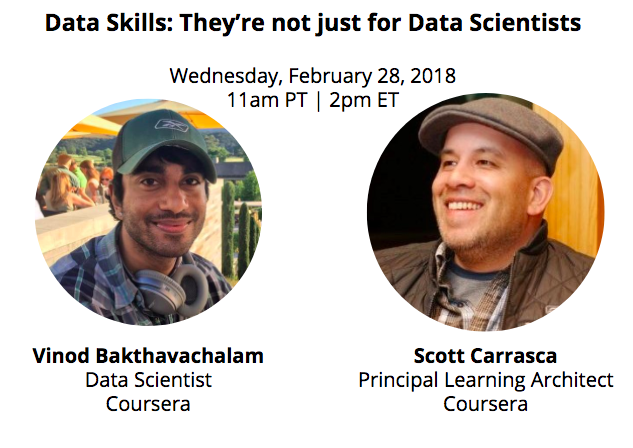 Coursera for Business is hosting a webcast, “Data Skills: They’re not just for Data Scientists“, on Wednesday, February 28. 2018. Register here. Data matters, as it is transforming how we understand our business. Leveraging data for meaningful impact requires strong data scientists. In fact, demand for these roles is expected to grow by 28% in the next 3 years, exceeding supply. Thus, companies will need to develop data scientists from within. Businesses also need to ensure analysts, product leads and marketers have sufficient data skills to glean insights and find opportunities from the data. It is increasingly important that your entire organization is data savvy to take full advantage of this digital transformation. Register here to join us for the webcast.